Scopri tutto su bunbury, concerti, eventi, news e molto altro! 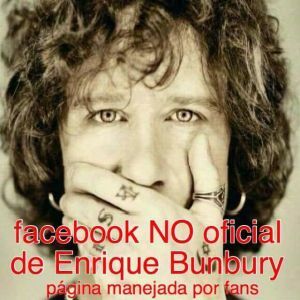 Enrique Bunbury, born August 11, 1967, is a Spanish singer-songwriter. He has been described as "by far, the most international star of rock en español." After adopting the nickname of Bunbury, taken from the Oscar Wilde stage play The Importance of Being Earnest, the musician founded the band Héroes del Silencio, becoming a major number in the Hispanic rock scene. The band eventually broke up in 1996 and Bunbury started his solo career in 1997 with an electro-rock album, Radical Sonora with his new band: Copi (piano), Del Moran (bass), Ramon Gacias (drums) and former Héroes del Silencio guitarist Alan Boguslavsky. The solo career of Bunbury unlike Héroes del Silencio has been very different in the musical sound, keeping the essence of rock, experimenting with various rhythms from electronic music and Middle Eastern music in the early stages of his solo career, to cabaret music, rancheras, blues, flamenco and tango, to salsa, milonga, boleros and cumbia in one of his last works which honors Latin America. According to La Banda Elastica, "Rock gods exist... and Enrique Bunbury belongs among them." He is known for his powerful, operatic voice.